Ive recently been looking at the problem of providing a balanced feed from an un-balanced atu. I had been using an auto-atu (CG-3000) with a string of ferrite chokes on the input side of the atu in order to float the whole unit above ground so that the output appears to be balanced. This of course relies upon providing sufficient common mode choking impedance, even with a worst case output load imbalance. Now Im aware of the arguments regarding where the common mode choke should be provided. Some folks insist upon using a 4:1 voltage transformer on the output of the atu to provide a pseudo balanced feed, others say use a 1:1 current balun on the output, and yet more say put a 1:1 current balun on the input. I have serious concerns about the use of 4:1 voltage (Ruthroff) baluns on the output of atus, especially those constructed on iron powder cores (see separate notes. These concerns are mainly associated with the very low values of core permeability and the subsequently low value of shunt impedance presented across the windings. This can be reduced by using a greater number of winding turns; however this usually results in spurious self resonances occurring, especially when connected to reactive load impedance such as an antenna. The other issue is that when attempting to match an electrically short antenna (low R high XC) the use of a 4:1 ratio transformer attempts to convert this to an even lower impedance, which introduces significantly more loss than would otherwise be present. The atu may be able to match the modified load when a 4:1 balun is in circuit, but Im not sure how efficient this combination actually is. As part of these discussions a UK Amateur (Steve Hunt, G3TXQ) has suggested that I try taking some thermal images of a 4:1 voltage balun and a 1:1 current balun connected to the output of an atu when connected to a variety of loads. He thought that that this may help show which combination is the most efficient. I started thinking about this and realised that I would have to build the two baluns on the same type of core material, using the same number of turns, in order to establish a common starting point. I also realised that I may have to provide an extra separate 1:1 balun as part of the test setup in order to try and eliminate common mode currents, which would be significantly worse when using the voltage balun. 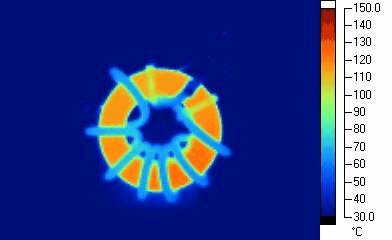 I hoped that by doing this the thermal images would show up lost power purely in the differential mode. I made up a 1:1 current balun on a T240-K core with 12 bifilar turns of Thermaleze in PTFE sleeving. (about 120ohm TL characteristic impedance). I terminated his with a 50ohm load and measured the transmission loss. As I had noticed previously when building this style balun, the loss at 30MHz was very poor. I assumed that this was purely due to the open wire construction, but then realised that it was actually the transmission line operating as an impedance transformer, the effect of which became more noticeable as the frequency increased and the length of transmission line became a greater proportion of the wavelength long. In order to test this theory, I built another 1:1 transmission line transformer this time using some PTFE 93ohm coax. Sure enough the same effect occurs, as can be seen in the graph below. The orange trace shows the loss through the bifilar 120ohm TL transformer when terminated with a 50ohm load, the red trace shows the loss through the 93 ohm coax TL transformer when terminated with a 50ohm load. In order to further validate this theory I measured the input impedance of the transmission line transformers when terminated with a 50ohm load, and as can be seen from the graph the impedance does indeed change with frequency. The orange trace shows the input impedance of the bifilar 120ohm TL transformer when terminated in 50ohms, the red trace shows the input impedance of the 93 ohm coax TL transformer terminated in 50ohms. As expected the transmission line acts as an impedance transformer when the line is ¼ wavelength long, converting the 50 ohm source impedance into 200 ohms using the 93 ohm coax and 250 ohms when using the 120 ohm bifilar wire. So the 1:1 transmission line transformer is only efficient when it is terminated in its own characteristic impedance, or when the length of wire used to form the transmission line winding is significantly shorter than a wavelength at the desired operating frequency (which may create a problem if you wish to obtain good choking performance). 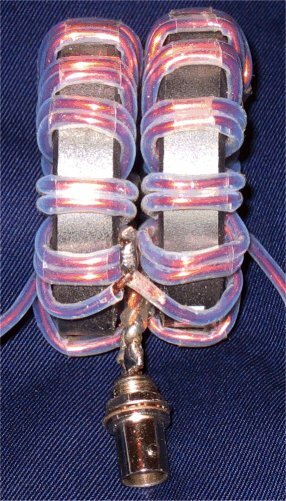 I have found it very difficult to build low loss 1:1 transformers with a 50 ohm characteristic impedance using bifilar windings, as you need to get the wire diameter and spacing exactly right. For this reason its much easier and less problematic to use 50 ohm coax to form the winding. However this is only important if you intend to connect it to a 50 ohm source and load. If the 1:1 current balun is used on the output of an atu where the terminating impedance is likely to vary significantly with a change of operating frequency, it is likely that you will have additional losses due to the impedance mismatch between the TX, transmission line transformer and load. Just how significant this will be will depend upon the characteristic impedance of the transmission line transformer windings, the source impedance, load impedance and frequency of operation. It may also affect the tuning of the atu (and its efficiency) due to the impedance transformation (as would be the case if the length of feeder connecting the antenna was lengthened). Although the atu should take care of the mismatch as it appears to be just another component of the antenna system, some additional losses will occur due to the impedance mismatch between source, transmission line and load. This may be especially problematic if the antenna feed impedance is very high, low, or contains a disproportionally large reactive component. After a large number of different experiments and loss measurements on 4:1 voltage baluns and 1:1 current baluns I now accept that it's a very complex subject with lots of variables, which make it quite difficult to work out whats going on, however I do now understand why ATU manufacturers like to use voltage baluns. The lack of common mode rejection means that if there is any load imbalance, the common mode current tends to be radiated by the feeder (fed against the earth connection, wherever that happens to be). With the current balun any common mode current resulting from an imbalance is dissipated either in the balun or in the ATU feeding it, which can cause major overheating problems (even at relatively modest power levels). For example, if you loose one leg of a ladder line fed doublet, the voltage balun will continue to feed power up the remaining leg (radiating as something like an inverted L), with a current balun something bad will happen somewhere, either in the ATU or the balun (or both). As the power which is not being radiated has to dissipate somewhere. During my tests with the current balun Ive had the ATU overheating, the balun core overheating and a corona discharge off the open circuit end of the balun secondary (and I was only running 100w at 3.6MHz). The voltage balun always dumped some of the power somewhere else. The picture below shows a thermal image if a 1:1 current balun with only one of the output ports connected to a load. No current flows into the load so a large proportion of the RF power is dissipated in the balun core. Note that the actual windings remain quite cool in comparison. I could only leave the RF power running for a about 30 seconds in this configuration as the core was getting too hot. So which is the best type of balun to use ? Generally I would say a current balun. As it ensures that power is only radiated from the part of the antenna system you want it to be from. It prevents common mode current from flowing along the feeder which can cause RF in the shack and the pickup of unwanted noise on receive. I believe this problem is frequently overlooked by folks who have an unbalanced tuner which uses a voltage balun on the output in an attempt to create a pseudo balanced feed. It DOES NOT provide a true balanced feed. Any imbalance on the antenna system will result in a proportion of the transmitted power being radiated from somewhere else in the system, usually the feeder or shack wiring. Loose one leg of a balanced antenna and the remaining half will radiate some power, as will the feeder and other items in the shack. A current balun operated under the same conditions would only allow a very small proportion of the RF power to be radiated from the antenna (the exact proportion depending upon the amount of common mode rejection provided by the balun). Unfortunately as I said before this can easily result in the high proportion of un-radiated power being dissipated somewhere else with the potential to cause damage. It is also important to choose the optimum transformation ratio in order to best match the source to the load. Some of the largest losses I observed were when I fed a low impedance load via a balun providing a much higher source impedance. As an example when feeding a load of 6 J10 using a balun made from some 93 ohm coax with a thin inner core, I measured about 2 to 3dB loss when configured as a 1:1 current balun. Modifying this to become a 4:1 balun, I couldnt get the atu to match the load. However when I reversed the connections to make it step-up the low impedance, the loss reduced quite considerably (although this was partially due to a reduction in atu and connecting cable losses). By using a thermal camera I was able to observe that the losses were occurring along the length of the transformer winding and not in the balun core. So if you are likely to be feeding a low impedance load use a reasonable size gauge of wire for the transformer windings. I suspect that anyone who is able to obtain a reasonable match when using an electrically very short antenna fed via a 4:1 balun is only able to do so because there are other losses somewhere in the antenna system. Either a high value of earth resistance (not enough radials), high balun, feeder or atu loss, or a combination of all of these factors. High impedance loads present other problems, primarily due to the presence of very high voltages and balun core losses. During my tests I found that a 4:1 voltage transformer wound using 93 ohm PTFE insulated coax had developed a fault, resulting in localised heating of part of the core. The outer layer of insulation around the cable had broken down resulting in RF arcing between the screen of the cable in the balun core material in two places. Although PTFE insulated cable usually has a high voltage rating between the screen and inner core, the jacket material may not be able to stand such a high voltage. So I would recommend either wrapping the cable jacket, or balun core with additional layers of PTFE insulation (such as plumbers tape). 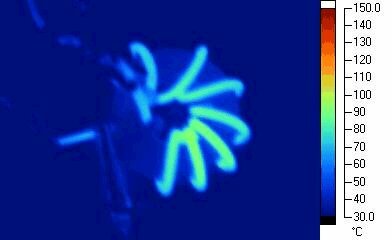 Thermal image of a faulty 4:1 voltage transformer, with insulation breakdown causing arcing to the balun core. After a period of operating an atu with a balun on the input, I've now concluded that if you wish to make an un-balanced atu appear to be balanced, the most effective way to perform this is to put a 1:1 current balun on the output of the atu. This ensures that there are no issues associated with floating the whole atu at RF potential. It is important to recognise that a high voltage will exist between the ends of the windings, so only use cable with adequate high voltage insulation in order to prevent arcing to the balun core. It is also important to over engineer the balun so that it can withstand worst case operating conditions. Even though I'm only using 100 watts, I'm currently using eight bifilar turns of 100 Ohm balanced line wound on five stacked FT240-31 cores. Similar to the design shown in the picture below. I had to use this number of cores in order to get sufficent choking impedance on the LF bands, with the least number of turns. When using ferrite materials which provide a mainly resistive choking impedance. It's important that you can achieve a high enough value of resistive series impdedance. So that the core cannot become over-dissipated under worst case conditions. If the resistive choking impdeance is only in the order of a few tens of ohms at some frequencies. A lot of power can be dissipated in the core. See Steve G3TXQ's website for some useful graphs. For performance graphs of my chokes see lower down this page. A lot depends upon the purpose a 1:1 balun is being used for. If it's intended to be used in a 50 Ohm coaxial transmission line, the main problem in constructing a 1:1 current balun using bifilar windings is that you have to get the impedance of the transmission line formed by the two parallel wires exactly correct. You can only do this by using the correct gauge wire with the correct thickness of insulation and separation between the cores. Otherwise the transformer will present an impedance mismatch between the source and load, resulting in additional losses. The only foolproof method I have found is to wind coax on a suitable ferrite ring or pass it through a large number (at least 30) of ferrite sleeves. I also suggest that for the balun to be effective you should aim to provide at least 1 K ohm common mode rejection between the input and output of the balun. If you wish to use the balun with 50 ohm coax at 1.8MHz in order to meet the 1K Ohm design rule (which equates to approximately 88uH). As an example medium size ferrite sleeves (such as CPC part number CBBR6942) will add about 1uH inductance per sleeve, when threaded over coax, so you would need 88 ferrite sleeves to obtain the required impedance. It is more cost effective to pass or wrap multiple turns of coax through ferrite sleeves as 10 turns through a suitable sized ring or core, which would provide a similar value of series impedance. Beware of different core types, many large ring cores are actually made from powdered iron, and they do not provide as high a value of inductance or as wide an operating bandwidth as ferrite. You can calculate inductance values for other frequencies, but I would always recommend as much ferrite as possible, as this generally reduces the number of turns required, reduces interwinding capacity and improves isolation at the HF end of the spectrum. Twelve turns of coax on an FT240-31 core is a good starting point. Or eight turns on four or five stacked cores are better, as this allows fewer turns to be used. If the 1:1 balun is to be used to provide a balanced feed from an unbalanced tuner, then the design can be relaxed slightly as the termination impedances at the input and output of the balun are likely to vary considerably over the range of operating frequencies. I try to keep the impedance presented by the antenna and feeder within moderate limits, so that balun losses are minimised. So using 100 ohm balanced line for the balun winding is a good compromise in terms of impedance excursions. It's very difficult to obtain good choking performance over the full 1.8 to 30MHz frequency range, but I find that it's best to concentrate on maximising the performance at the LF end of the spectrum. As this is where the largest gain in terms of RX noise reduction can be achieved. As an example, I built a G5RV antenna and used 10 turns of coax on a 4 former as the 1:1 balun at the base of the open wire feeder section. I thought that the antenna was working perfectly well, until I replaced the 10 turns of coax balun with two ring cores. This reduced the noise level on 80m from S6 to S0 and on 160m from S8 to S0. The difference in the reception of weak signals was staggering, and I have now added additional ferrite sleeves along the coax in order to further reduce the background noise level. This experience suggested to me that many amateurs who have tried adding a balun to a G5RV and have not noticed a difference, may in fact have not have been using a suitable design. For a 1:1 tuner balun I would suggest eight bifilar turns on five stacked FT240-31 cores. The cores are supported on a length of plastic conduit, which hold the turns in place. Plots showing Common Mode impedance with both wire pairs connected together and measured as an inductor. The basic principle is that two 1:1 baluns are used. The inputs are connected in parallel and the balanced outputs are connected in series, which provides a 4:1 impedance transformation. The bifilar pair used for the transmission line needs to have a characteristic impedance of 100 Ohms. I used 14 gauge thermaleze wire with PTFE sleeving to obtain the correct impedance. Two 1:1 baluns consisting of fourteen bifilar turns on a FT240-K core give good results from 1.8 MHz to 52MHz. If you wish to feed a random length of wire, vertical antenna or some other form of unbalanced antenna then I suggest you use a 4:1 voltage balun as an unun. This gave good performance from 1.8 to 52MHz, with less than 0.1dB loss over most of the range up to 30MHz, and approx 0.5dB at 50MHz. This was measured with a miniVNA by halving the loss of two Ununs connected back to back I could have added more turns without affecting the performance over 1.8 to 30MHz (I started at about 15 turns) but I found could achieve sufficient bandwidth to include 50MHz by sacrificing a bit of additional loss at each end of the operating range. Further details relating to verticals and ununs can be found on this page. If it is being used in conjunction with an ATU to match to a random length of wire, the impedance presented by the antenna is likely to be much higher than 200 Ohms. A ½ wavelength of wire can have input impedance as high as 5 K ohms, so its a good idea to choose the length carefully - see my notes relating to auto-tuners. Optimised with 6 trifilar turns of 18AWG silver plated stranded wire. PTFE insulation, 1.85mm outer dia (CPC part number CB10433) wound on FT240-61 core. I have found that a lot of details regarding balun construction that can be found on the internet are flawed, especially those relating to Ruthroff voltage baluns. My extensive research on this subject can be found here. 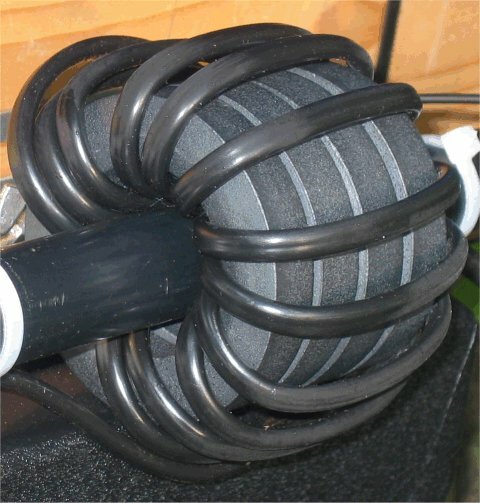 Common designs use either a few turns of coax on an air core, or bifilar windings on an Iron powder, ferrite rod or ring core. These can work well over a certain frequency range, but there are so many variables in the construction that it is unlikely you will get consistently good results over a wide bandwidth. In this application you need to get the cable size, spacing and coupling between cable cores just right, so that you form a correctly balanced transmission line transformer. I have seen all sorts of twin cable, twisted pairs and mains cable being suggested for this purpose, but when I have constructed them and measured the bandwidth, loss or impedance match, they did not work at all well. In addition to these problems you also need to be aware of the ‘ferrite’ cores being sold at radio rallies or on e-Bay. A large number of the ones I have seen for sale are actually a strange mix of materials, and have been designed for use in switched mode power supplies where high inductances or large currents are required at frequencies below 1MHz . In either case they may not be suitable for use as baluns or transformers on the LF and HF bands unless the design is optimised, and you really don't know what sort of performance you are obtaining unless you make measurements. These days I take a small impedance bridge to rallies and measure values. In many cases the folks selling them continue to insist they are ferrite despite any evidence to the contrary. The easiest way to identify most ferrite materials is to wind about four turns of wire through the core and then measure the lowest frequency at which the value of reactive impedance equal resistive impedance i.e. X=R. There will be some variation between different batches and sizes of materials. But if you can plot the results graphically you can easily identify the 'signature' of each material. Iron powder has a slightly different 'signature' it usually has a very low resistive component, which peaks to a higher value near self resonance. The more lossy the material the broader and lower value of resistive peak is apparent. To illustrate this point here are some loss measurements made on ring cores recovered from switched mode power supplies. In each case the windings were 5 turns of 1mm wire bifilar wound as a 1:1 transformer. As you can see there is great deal of variation between the results depending upon the type of core material. Powdered iron cores are popular for high power baluns, but they don’t offer much inductance per turn of wire, so their effectiveness when used as baluns can be limited. Ferrite materials provide a much higher impedance value per turn of wire and are much more effective over a wider frequency range, but they can be very lossy when connected to a mismatched load, and heat up to a point where irreversible damage occurs. Many constructors simply measure the input VSWR when a matched load is connected to the output, but this doesn’t tell the full story. 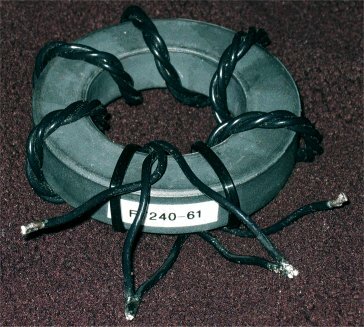 Many people also assume that the iron powder core works as a conventional low frequency transformer, and that the core presents a closed magnetic loop. This is not the case, if windings are placed on the opposite sides of a reasonably sized core, the losses can be considerable. During previous experiments I found that fitting a balun at one end of a cable was not always satisfactory. The effectiveness of the balun depends upon where it is placed relative to the current maximum (low impedance node), especially if the cable happens to be an odd multiple of a wavelength at the desired operating frequency, A balun constructed with ferrite sleeves spread out along the whole length of a cable (in my case about 80 recovered from VGA monitor cables) seemed to perform better than a single lumped high Z balun placed at just one end. Note that adding more turns through a core is usually more effective (twice the number of turns usually makes 12dB improvement) than adding more cores (twice the number of cores usually makes 6dB improvement) although you will eventually reach a point of diminishing returns, where it is no longer possible to make any further improvement. Here is a graph showing the transmission loss through a series of chokes when measured with a tracking generator with 50 ohm source and load. The red trace shows a 2 turn choke on a stack of 5 ferrite sleeves, and the orange trace shows 2 x 2 turn chokes connected in series. The green trace shows a 4 turn choke on a stack of 5 ferrite sleeves, and the blue trace shows 2 x 4 turn chokes connected in series. Also note on the blue trace how the high value of inductance and capacitance between windings is starting to produce a parallel resonance at around 10MHz. 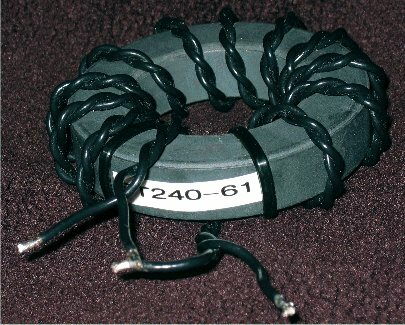 Separating the chokes by a few metres of cable can noticeably improve the overall performance, as it is more likely to place at least one of the chokes closer to a current maximum, and in addition reduces the capacitance between sets of windings which improves the high frequency choking performance. Here are another set of graphs showing the showing the transmission loss through a series of chokes when measured with a tracking generator with 50 ohm source and load. The red trace shows just a single length of wire 2.5m long (which is about 1/2 wavelength long at about 50MHz), connected between the source and load. The green trace shows two chokes connected in series at the mid point of the wire (which is a high impedance node, where the current is at a minimum), and the blue trace shows the same two chokes but this time with one at each end of the cable (low impedance nodes, where the current at maximum). Notice how the additional series impedance added by the chokes has improved the overall common mode rejection at the low frequencies, where the wire is only a fraction of a wavelength long. However at frequencies around the 1/2 wave resonance of the wire (remember that the wire is terminated with a 50 ohm load at each end, so the high impedance node is at the 1/4 wave position, which is half way along the wire) adding a choke in the middle of the wire (at the high impedance node) can actually make the common mode rejection worse at that frequency. 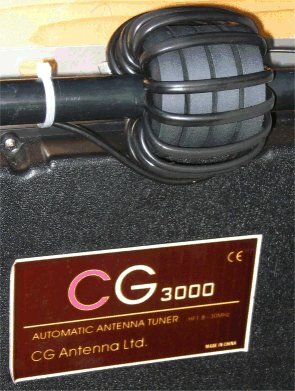 In practice most coaxial antenna feeders are not connected to low impedance points at each end. It is more likely that one end will be terminated with low impedance to earth, whilst the other end will be floating at a much higher impedance somewhere up in the sky. So it's important to give some thought to the position at which choke baluns will be most effective. This becomes even more problematic when operation on a number of different frequencies is required. As the position of the common mode current nodes on the outer of the coax will change with frequency. I have found it very difficult to achieve more than about 20dB common mode rejection, over a broad frequency range (1.8 to 52MHz) using a single choke balun wound on a ferrite core. This represents an impedance of about 1,000 ohms when measured with a tracking generator and analyser which have a 50 ohm source and load impedance. This is barely adequate if you are trying to isolate a coax feed to a balanced antenna such as a dipole. Modelling such an antenna with EZNEC suggests that a minimum choking impedance of about 1,000 ohms at the feed point is likely to be required, in order to stop the outer screen of the coax from appearing to be directly connected to one side of the dipole. But it actually requires a choking of impedance of around 5,000 ohms before the interaction between coax and dipole becomes negligible. I have found that it is possible to achieve much greater common mode rejection over a narrower frequency range, by 'tuning' the number of turns and inter-winding capacitance, in order to create what is effectively a parallel tuned circuit. Using this technique it is possible to achieve greater than 50dB common mode rejection at a specific frequency. Most of my test cables have fairly chunky ferrite baluns at each end, so that at least one of them is likely to be at a current maximum where it enters an earthed equipment enclosure. As I mentioned before, simply adding a choke balun with say 20dB common mode rejection (measured with a tracking generator with 50 ohm source and load) to a cable which already has a another similar choke balun on it, does not provide 40dB isolation. It only adds about another 6dB and shifts the frequency at which maximum choking performance to a lower frequency. Unfortunately this is usually accompanied by a reduction of choking performance at higher frequencies, so the number of turns and size of core need to be optimised in order to give the best performance over the desired range of operating frequencies. If I can't achieve good performance over the whole range of frequencies, I normally choose to have greater choking performance at the LF end of the spectrum, where induced noise from electrical equipment tends to be more problematic. On long coax cable runs I also use another method, derived from an EMI prevention technique. I place an earth spike at multiple points along the coax feeder with a choke balun each side of it. This introduces a low impedance path to earth with a high impedance series choke either side (like a low pass filter). I also have a series of ferrite sleeves at other various 'random' points along the feeder in order to try and provide a wideband choking characteristic. All of these techniques have contributed to reducing the receive noise floor when operating on the LF bands and kept RF out of the house and neighbouring properties. Perhaps specially manufactured coax with a continuous ferrite outer sleeve would be the best solution ? As a result of observing effects such as those described above. I would strongly suggest measuring the balun or transformer insertion loss. The easiest way to do this by constructing two baluns and connecting them back to back. Connect a low power transmitter and VSWR bridge at the input and a suitable test load at the output. Transmit at the lowest frequency of operation and set the <?xml:namespace prefix = st1 />CAL control for a full scale meter reading. Stop transmitting and reconnect the VSWR meter between the output of the balun and the test load. Transmit again and take a new meter reading. The power difference between input and output positions when converted to dBs will give you the loss figure for two baluns. Halve this to get the loss through one. Repeat the same test at the highest frequency of operation, and you will have a good idea of the overall balun performance. Power loss at either frequency can suggest not enough inductance or an incorrect amount of coupling between windings. Another method suggest by Iain, VK5ZD, is to use an ATU and power meter as shown below. Note that the balun is reversed in the second configuration, so that the high impedance port is connected to the atu. Make a power measurement in the first configuration and then tune the atu for maximum measured power in the second configuration. Performing the calculation will give you a good indication of loss though the balun. As a further example of how important this can be, when I first bought a HF transceiver, I wanted to get on air quickly. So I looked in my junkbox and found two baluns. One was a commercial unit I had bought as surplus. This was intended for use with a marine HF radio, using the backstay as the antenna. 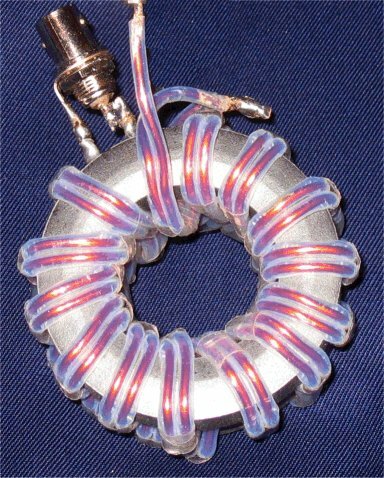 The other was one that I had made (and used on 80m) about 10 years ago, which was wound on 2 diameter 'ferrite' ring I had bought at a radio rally. I tried the first balun with a 10m vertical length of wire and the second with a 1/2 wave dipole cut for 40m. Both antennas gave good VSWR readings and I had a few reasonable contacts, with moderate signal reports being exchanged both ways. At a later stage when I started constructing more baluns, I finally got around to measuring the performance of these two. The commercial unit which I initially thought had either a 4:1 or 9:1 ratio turned out to be a 1:1 ratio with a loss of 3dB at 3.5MHz and about 10dB at 30MHz, my home built balun also had a loss of about 10dB but that was from 1.8Mhz up to and beyond 30MHz. So both baluns were effectively just working as high power attenuators. In the worst case only a 10th of my transmitter output power was reaching the antenna wire. Other tests can be made to measure the isolation and balance, but the match and insertion loss will usually indicate other problems first.